The Milly Card is Mill Road’s loyalty card scheme. The scheme is run by The Mill Road Society, an off-shoot of the No Mill Road Tesco Campaign. The Milly Card loyalty scheme exists to encourage people to use the shops and other services available on Mill Road, Cambridge, and the area around Mill Road. The purpose of the scheme is to allow local residents to show their suport for local traders and for Mill Road traders to have the opportunity to respond generously. This scheme will encourage business profits and goodwill to circulate within our community for the benefit of all who live here. Membership costs £2 per person. This gives a MILLY membership card, which, when presented to participating traders, will entitile the holder to special offers and discounts. The list of offers is available on the Milly Card website. Use the Application Form to apply for a Milly Card. 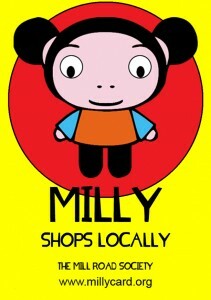 For full details of the scheme, go to the Milly Card website at www.millycard.org. The Milly stall in Hope St Yard for two hours on 16th May saw lots of interest and new sign-ups.